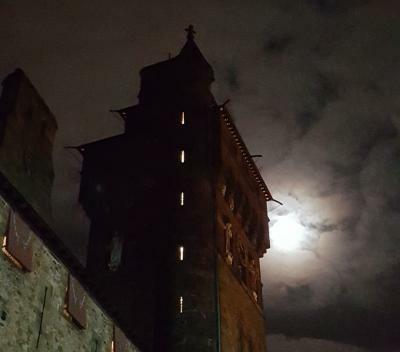 Last Monday, over 20 Circle members and ladies visited Cardiff Castle for a ghostly tour of the castle in the dark. Local historian, James Cowan, explained that while parts of the “house” at the castle were built or modified by William Burgess in Victorian times the main centre section dates from the 15th century. Other parts of the castle included sections of the Roman walls and of course the Norman keep. James then regaled the brave participants with tales of the the phantom coach and horses, a portent of death in the castle and the 2nd Marquis of Bute who died suddenly in the castle in 1848 and has been seen in various rooms in the castle. 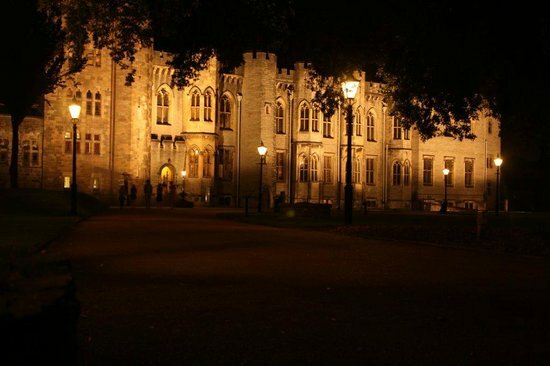 Other ghostly apparitions that have been reported in the castle include the grey lady, who James suggested might be Anne Neville, wife of Richard III, who owned the castle and the ghostly soldier thought to be Lieutenant Colonel Ninian Crichton-Stuart, the second son of the 3rd Marquis of Bute, who was killed in action in 1915. After all these ghostly tales nerves needed calming so it was across to the Goat Major for a swift half. Thanks to Bro Mark Johnson for organising the evening.